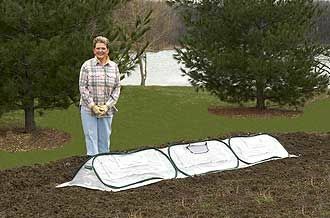 The RowHouse portable cold frame is compact and lightweight for easy transport, setup, and take down. No assembly is required. The 100% waterproof Gro-Tec™ material is UV resistant with rip stop protection for longer life of your greenhouse. Setup, take down and store in seconds! 3 large zippered windows provide easy access. 3-screened vents allow optimum ventilation and pest protection. Great for ‘Hardening off’ young plants. RowHouse has 3 screened windows and vents which measure 11" x 34." and 2 portholes for hose and power cord access.